Montego Bay takes you to Jamaica’s exquisite north coast and its shimmering clear waters bordered by ribbons of white sand beaches. Immerse yourself in Jamaica’s second city, complete with pristine coral reefs, vibrant Caribbean culture and reggae vibes. Families will enjoy the aqua park, go karts, and warm shallow waters of Walter Fletcher Beach, while couples frequent the celebrity haunt that is Doctor’s Cave Beach – home to an array of watersports, golden sands, and a 100-year-old bathing club. For divers and adventurers, the Montego Bay Marine Park offers mangroves and coral reefs that are home to groupers, barracudas, and turtles, which can also be viewed from a glass-bottomed catamaran. Affectionately known as Mo Bay by its friendly residents, Montego Bay offers a lively three kilometre strip of authentic souvenir shops, swanky bars, mouth watering restaurants, and tantalising food stands along Gloucester Avenue, which runs parallel with the ocean, and comes alive after dark. Holidays in Montego Bay offer a slice of rich culture and inspiring history within its exquisite plantation houses which transport you back to colonial times long ago. Explore the cobblestones of Sam Sharpe Square where pattie shops and the historic Gully Market give an insight into Jamaican tradition. When it comes to dining, you’ll find authentic eateries as well as upmarket restaurants serving delectable Jamaican specialities including the national dish of ackee and saltfish, in addition to freshly caught oysters. 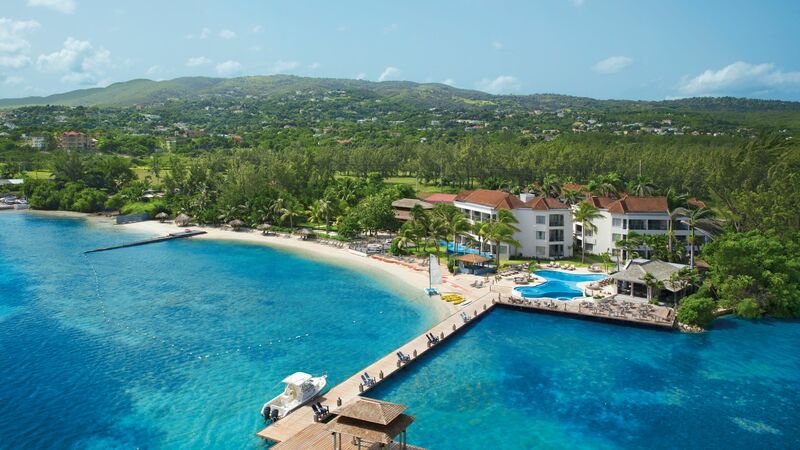 Montego Bay is home to a plethora of excellent accommodation and Sovereign only offers the best. Allow us to tailor make a holiday for you and choose to stay at the Zoetry Montego Bay where you can enjoy boutique accommodation overlooking the Caribbean Sea. Flight time from the UK to Jamaica is approximately 9 hours 45 minutes. Transfer time from Montego Bay airport to Montego Bay is approximately 30 minutes. The island basks in sunshine for most of the year, with highs usually hovering in the high 20s and early 30s. The best time to visit Jamaica is between December and April, although you can still expect plenty of sunshine in the 'rainy' months between May and November. UK visitors don't need a visa for Jamaica (unless you're planning on staying for longer than 90 days). The official language of Jamaica is English.